Snack Girl is obsessed with breakfast. Why? Because, it is the most important meal of the day and so many of us skip it or eat the wrong food. What food am I talking about? 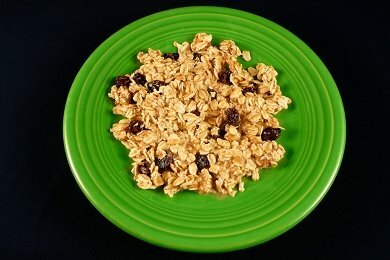 Well, Kashi GoLean Review is one example of a cereal that has WAY to much sugar in it to be a truly healthy breakfast. In fact, since I wrote my Candy or Breakfast? Evaluate Your Cereal post, I have had A LOT of trouble finding a decent cereal to feed my family (Cheerios was one exception). What to do? In January, I wrote a post - No Bake Nut Butter Oatmeal Cookie - and it really took off here at home. My children demand their "Breakfast Cookie" every morning and I was having trouble with their demands. Alex wanted raisins and chocolate chips - Ruby didn't - and I kept running out of small plates. And, every night I was staying up making them breakfast. Which would have been fine, except that at around 7 PM I start to wane to the point of comatose. I am an early morning person - not a night person. So I came up with a recipe that would feed them for multiple days and allow members of the family to adjust the cookie to their specifications. Think of this mixture as a blank canvas on which to paint your favorite breakfast. The great thing is that this breakfast is completely comprised of whole food. Of course peanut butter is mushed peanuts, and Maple Syrup is concentrated maple sap, but these are minimally processed compared to commercial cereal. This breakfast is really healthy and contains whole grains and protein to start your day with a level of sugar that YOU control. In addition, it makes your morning easier because you have already made it. All you do is serve it on a plate! Mix oats, milk, peanut butter, and syrup in a small bowl. Taste to ensure it is sweet enough for your palate. Cover bowl with lid or plastic wrap and let sit overnight. When ready to serve, mix in desired extras and mash on plate. Enjoy! Have you changed from eating cereal in the morning? What do you eat now? Is a GoGurt a Healthy Go or a Junk Food No? I seldom buy cereal anymore. We eat a lot of homemade granola, eggs, yogurt, and fruit for breakfast. I find this recipe intriguing. I look forward to trying it out with rice milk, coconut cream (rather than peanutbutter), and stevia (rather than syrups). I'd also add walnuts, flax, and cinnamon for added protein & antioxidants. Topped, of course, with fresh blueberries from the garden. Yum! Have you tried Kashi GoLean (as oppose to Kashi GoLean Crunch)? It's actually much lower in sugar (6g) and for 140 calories you get 13g of protein and 10g of fiber. It's actually really tasty too! Because of the protein and fiber it makes for a filling breakfast! Herbalife has children's shakes also! I've triad the Go Lean plan and Optomum Slim from Nature's Path, measured blood sugar every 30min foro a 2-hour period in pre-diabetic people. I've added 8g of protein, any source, and it works fantastic. Top of portion? Half cup of cereal plus rolled oats 2 tbsp and some fruit low glycemic. Blood sugar keeps ok. This is similar to Overnight Oats which I've recently tried and love! I just mix the amount of oats that I want (usually 1/3 or 1/2 cup) with equal parts milk and plain yogurt. So 1/3 cup oats, 1/3 cup milk, 1/3 cup yogurt. Then I add in some frozen fruit and mix all together. Refrigerate overnight. In the morning I drizzle on some melted nut butter or coconut butter. It's delicious and great for oatmeal lovers when it's hot outside. I'm definitely going to have to try this out on my stepkids. They don't live with us, but they're with us every other weekend, and while they might eat processed foods at their mom's, I want to encourage them to eat REAL food at ours. I bet a banana chocolate chip version would please everyone! A few years ago, when I was trying to lose weight and therefore reducing my caloric intake, I discovered that my typical breakfasts just weren't cutting it. They had too much sugar in them and not enough protein/fat to keep me satisfied for at least three-four hours. I also discovered that it was better that I ate a smaller breakfast and saved a little bit of food for later in the mid-morning (after about 3-4 hours) instead of trying to go all the way to lunch (5 hours or so) without eating. I always failed and ended up munching on something not so good for me. I used to eat cereal with fruit. Now I eat non-fat plain Greek yogurt with some berries and honey. The yogut is high in protein (higher than regular yogurt) and the fruit has filling fiber. And the honey is enough sweetness to meet my need. Then about mid-morning I will often eat a cinnamon apple flavored rice cake with about a Tbsp of almond butter. Or a piece of string cheese and some fruit. Even if those cereals are low in sugar, which most aren't, the grains still spike up your blood sugar if not combined with some fat/protein. Try to look at breakfast a different way - you don't have to eat traditional breakfast foods for breakfast! Leftovers are good. I eat oatmeal every weekday breakfast, and depending on time will sometimes switch it up on the weekends. I find oatmeal is very hearty and filling and always makes me feel satisfied. It's also relatively inexpensive compared to other breakfast options. I don't add any sugar, but if you add a lot of milk it's great! Sometimes I will add raisins, almonds/almond powder or flax seed. BTW - my daughter has started eating raw oats. I think we'll start to make muesli! This is one of my favorite breakfasts! I like to use greek yogurt instead of the milk - makes it thicker with more protein! Love your blog! Almond milk, one frozen banana, tablespoon of spirulina, 2 raw eggs or rice vanilla protein powder, tablespoon of coconut oil. You get healthy fats, protein, fiber and the equivalent of 3 servings of green vegetables in a delicious milk shake! How much are we loving breakfast cookie at our house?? I swear by this...every morning (without fail) I have raw porridge oats, some bran, natural Greek yogurt, a few berries and choppe walnuts all mixed in with skimmed milk. Not only is it extremely delicious, but also very healthy too. I have been eating this breakfast for years now. It sets me up for the day and I never tire of it. I very rarely get any colds and am very fit and healthy..there must me something in it!